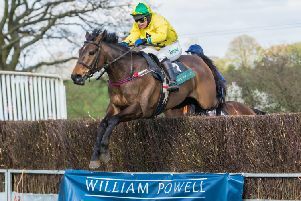 The six-year-old won Tuesday’s Toalsbet Live Race Simulator Handicap Hurdle at Southwell in the hands of Aidan Coleman. The Hull Farm handler has several runners heading north of the border for this weekend’s Ayr Grand National meeting. Ballydine heads Longsdon’s team for the feature race, Saturday’s Grade 3 Coral Scottish Grand National Handicap Chase. The nine-year-old was pulled up in last month’s Midlands Grand National at Uttoxeter but prior to that run had been placed at Haydock and Newbury. Stablemate Castafiore goes for the Grade 2 Jordan Electrics Ltd Future Champion Novices’ Chase on the same card. The six-year-old, a winner of six of her 23 races, was a creditable seventh in last month’s JLT Novices’ Chase at the Cheltenham Festival. Prior to that, she had won at Wincanton and Haydock before finding one too good at Kempton. Also on Saturday, Dandridge holds an entry in the listed Scotty Brand Handicap Chase. The highlight at next Wednesday’s meeting at Cheltenham is the £60,000 Grade 2 Cure Parkinson’s & Hambo Foundation Barchester Healthcare Silver Trophy Chase. Past winners of this contest include Norton’s Coin, Katabatic, Beech Road, Strong Promise, Seebald and Our Vic. The Edgehill owner is set to be represented by the Nicky Henderson-trained novice hurdler Igor, who he owns in a partnership. The home-bred six-year-old is entered in the £20,000 Citipost Novices’ Hurdle over an extended two and a half miles. Waley-Cohen said: “Igor was a good second on his first start at Ascot in November. “At Ascot last time out, he didn’t run very well and was well beaten. However, he was found subsequently to be under the weather and Nicky [Henderson] has been very happy with him since.